A policy is a set of privileges that governs the availability and limitations of certain features for a given user. Each user has a policy. Typically, an administrator creates a small number of policies, appropriate for different levels of users, and assigns a policy to each user. For more information about creating policies and applying them to new users, see the Conferencing Operations Guide. Select Contacts > Manage Contacts and Buddies to open the Manage Contacts and Users Window. 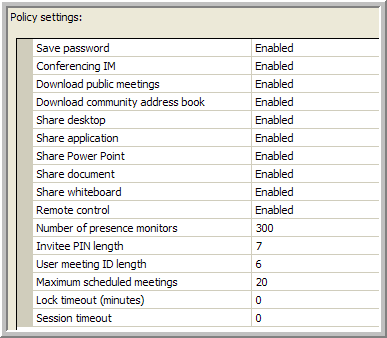 Select Admin > Manage Policies to open the Policy Manager Window. Select the policy you want to edit from the Select Policy to Edit drop-down list. In the confirmation dialog that appears, click Yes to save your changes to the policy, or click No to cancel your changes. The Policy Manager Window closes. Select the policy you want to copy from the Select Policy to Edit drop-down list. Select the policy you want to delete from the Select Policy to Edit drop-down list. In the dialog that appears, click Yes to delete the policy, or click No to cancel. Type a name for the new policy into the dialog that appears, then click OK. Select the policy you want to apply to this user from the Policy drop-down list, and click OK. The new policy for the user is in effect the next time that user signs on. An administrator must edit a user’s contact information from the Manage Contacts Window. Save Password: Allows the user to use the Save Password and Auto Sign On features (if it is enabled) or requires that the user log in for every use of the client (if it is disabled). When this feature is enabled, the user is provided with a Save Password option in the Sign On Window. If this option is selected, Conferencing stores the user’s password locally in encrypted form. The next time the user accesses the client, Conferencing uses the locally stored password to perform an automatic login. Conferencing IM: Allows or disallows Conferencing instant messaging and chat. This setting does not affect chat within the context of a meeting. Download Public Meetings: Allows or disallows the display of public meetings in the Meetings window. This setting is very helpful for large organizations; however, users must use the search feature to locate public meetings if this is disabled. Download Community Address Book: Allows or disallows the download of the Community Address Book. This setting is very helpful for large organizations; however, users must use the search feature to locate community users if this is disabled. Share Desktop: Allows or disallows the ability to share a desktop during a meeting. Share Application: Allows or disallows the ability to share an application during a meeting. Share PowerPoint: Allows or disallows the ability to share a PowerPoint* presentation during a meeting. Share Document: Allows or disallows the ability to share a document during a meeting. Share Whiteboard: Allows or disallows the ability to share the whiteboard during a meeting. Remote Control: Allows or disallows the ability for meeting attendees to be given control of the presenter’s desktop or application. Number of Presence Monitors: Total number of buddies allowed. Invitee PIN Length: Sets the number of digits in a Meeting PIN. User Meeting ID Length: Sets the number of digits in Meeting ID. Lock Timeout (minutes): The number of minutes of inactivity before the user is required to unlock the client by entering a password. Set this to 0 to eliminate any locks. Session Timeout (minutes): The number of minutes of inactivity before the client is required to sign on again. Set this to 0 to eliminate any timeouts.